On June 7, H.E. 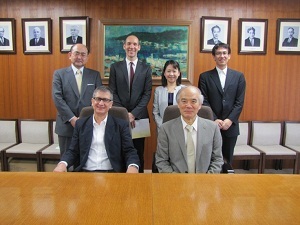 Mr. Nissim Ben Shitrit, Ambassador of Israel to Japan paid a courtesy visit to Professor Takashi Onishi, President of Science Council of Japan (SCJ) and Dr. Fumiko Kasuga, Vice-President of SCJ in Charge of International Activities. During this visit the Ambassador expressed his expectation that young Japanese scientists will participate in an upcoming “Entrepreneurship Training Workshop for Young Scientists and Engineers” to be held in Jerusalem, October 13-15, 2013. Nobel Prize Laureate in Chemistry Dr. Dan Shechtman, Member of Israel Academy of Sciences and Humanities has initiated and will lead this workshop, where young scientists will learn many aspects for starting-up of technological ventures. This year especially emphasizes training Asian young scientists. After clarifying the purposes of the workshop, President Onishi welcomed the invitation and replied that the Young Academy Committee of SCJ will positively consider to the Ambassador’s request. The participants had an exchange of views and opinions on the international exchanges between Israel Academy of Sciences and Humanities and SCJ.